Dragon fruit- A white fruit with tiny black specks. Fleshy and somewhat sweet while remaining a bit bland at the same time. A favourite of Anjali-- and her diaper! C even had a dragon fruit popsicle which she loved-- she chose it because of the bright purple colour. Water apple- looks like our trini pomerac but as the name suggests, its a bit more watery and not as sweet. Good in a chow. Longan- I guess similar to lychee. Really delicious. Darin's a huge fan. 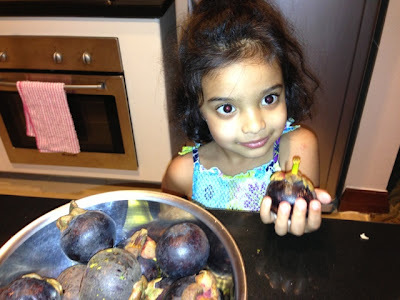 Mangosteen--- my favourite!! I am addicted and I have a bag everyday. I can't really liken it to anything but it's very sweet, juicy and is pure heaven--- okay, maybe I am a little biased. Cass is a big fan too. We're trying to get our fill as I've never seen it in Canada. 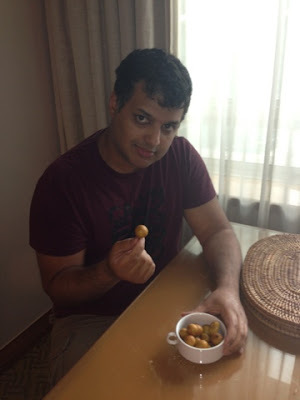 We've yet to try durian and to tell you the truth, I am a bit nervous and not sure I will try it. I'm very turned off by smells and the durian is supposed to be quite pungent. We've also had our fill of tropical fruit like papaya, yellow and pink watermelon, mangos, bananas, honeydew and guavas... everything is that much sweeter here! Our mangosteen! Or is it mangosteens?! Longing for a longan! There are so many jokes my twelve year old brain is making here.